This article shows how submissions from Google Forms sent to a Google Sheet can be set up to send notifications using Zapier. 1. Start by building a Google Form following the steps in our Google Form Integration Guide. 2. 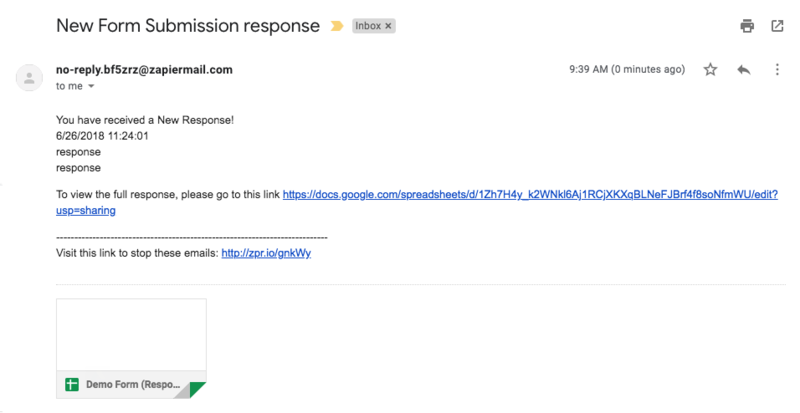 To have secure responses, you will want to have your Google Form send responses to a Google Sheet instead of having the responses go directly to an email. Here are the steps for saving responses to a Google Sheet. Keep your newly created Google Sheet open, we will be referring to it later in the walkthrough. 3. With these steps done, you are ready to start creating your notification using Zapier. Go to zapier.com and create an account. Then choose the Zaps tab in the top menu. 4. Click "Make a New Zap." 5. Go ahead and give your Zap a name similar to your Form's name. Then choose a trigger app. For this you will want to search for and select "Google Forms." 6. You will want to set the trigger to "New Response in Spreadsheet." 7. Connect the Google Account where your Form is located. You will be invited to sign in and share information with the Zap. Allow the information to be shared. 8. Your Google Sheet for Responses should appear as an option in the Spreadsheet dropdown. for the Worksheet, go ahead and choose the first response. If you haven't run a test response for your google sheet yet, please go ahead and do that now, otherwise there won't be a something to select in the Worksheet dropdown. 9. Pick a sample to test your Zap notification. You should be able to choose from the existing responses on your Google Sheet. 10. That's all you need to do to set up the trigger! Now let's set up the notification itself. Add an Action Step by clicking on the link on the main page or "Add a Step" in the sidebar. 11. Set the notification to be sent via email. This will allow you to send responses to emails that are not associated with the Google account the Form is on. 12. Click "Send Outbound Email" and then Save and Continue. 13. For the next step we will be linking the Google Sheet to the notification. 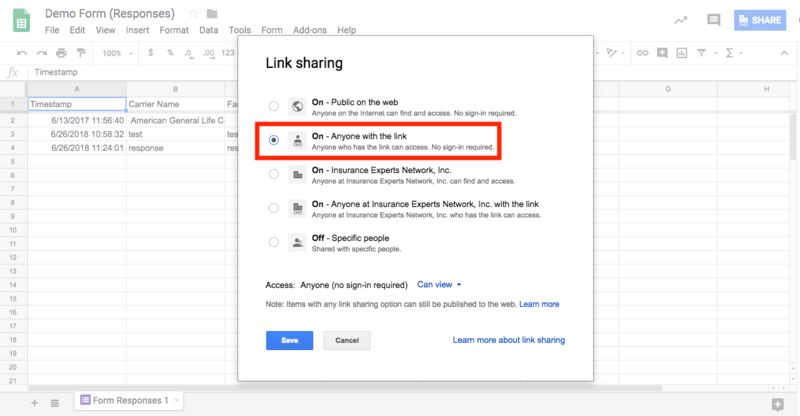 Go into your Google Sheet and make sure the Sharing options are set to "Anyone with the link" Then copy the link. 14. Configure the Email Notification to your preferences. You can choose up to 5 emails for the response to be sent to, set the subject line, and Body of the email. By clicking on the icon on the right of each textbox, you can have the content automatically fill with fields from the responses in the submission. Be sure to paste the link to your Google Sheet in the body of the email. This is so the entire submission can be viewed. When you have the email how you like it, Save and Continue. 15. Now it's time to test your notification! Go ahead and click "Send Test To Email by Zapier"
16. Shortly you should receive an email structured how you just set up. 17. If everything looks right, your notification is ready to go. Don't forget to turn the Zap on! That's the end of our walkthrough. Thanks for following along!